Sesame seeds – ½ kg. 1.) Clean the sesame seeds. 2.) In a kadai, roast the sesame seeds on a low flame. Stir continiously till the sesame seeds start tempering. 3.) Remove the sesame seeds from the flame and keep them aside. 4.) In a deep pan, heat the jaggery on a medium flame. Keep stirring till the jaggery melts and forms a thick syrup. 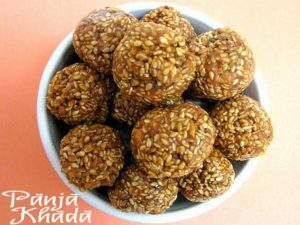 When the jaggery syrup starts boiling and leaving the sides of the pan, add the roasted sesame seeds and mix well till they are blended thoroughly. 5.) Form medium sized balls while the mixture is still hot. 6.) Allow the Ladoos to cool. Use as required. Follow the above recipe till step no. 4. After Step no. 4, pour the entire mixture on the back of a greased thali. Using a greased rolling pin, evenly spread out the entire mixture. Cut it into small square pieces and allow it to set.